Greece's deputy prime minister has said key cuts and fundraising measures may not be passed by parliament. Greece must pass new austerity measures to trigger the release of more bail-out cash from the EU and IMF - crucial if the country is to stay afloat. Parliament is due to start debating on Monday the programme of tax increases and spending cuts worth 28bn euros (£25bn, $40bn) over five years. Parliamentary approval is needed before the next bail-out payment is made. In an interview published on Sunday, the deputy prime minister, Theodor Pangalos, was optimistic about winning the first round of general votes on tax and spending targets and the creation of a privatisation agency. But he was more cautious about whether the government could get passed further legislation on individual budget measures and the privatisation of specific state assets. Mr Pangalos said: "I think the package of short and medium-term measures with which we basically hope to establish the framework to undertake reforms will be approved without difficulty." But he said approval of specific laws to bring in fiscal reforms and privatisations of public companies may be more difficult: "That's where we may have problems. I don't know whether some of our members of parliament will vote against it. It's possible." The ruling PASOK party has a slim majority, with 155 seats in a 300-seat strong parliament. 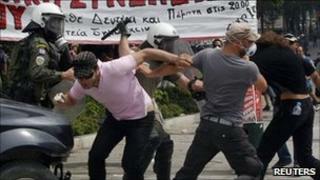 Austerity measures have proved highly unpopular in Greece, sparking riots and other protests. Unions have called a two-day national strike starting on Tuesday. Even as the next slice of aid under the existing 110bn euro payout is being discussed, the European Union and the International Monetary Fund are debating a second rescue package similar in size to the existing one. They want private lenders to help out with this for the first time by agreeing to softer lending terms for the Greeks. The UK Treasury has denied it is pressing UK banks to take a "haircut" on their Greek debt investments. Newspaper reports had said the Treasury was quietly pressurising banks to to take losses on their Greek bonds. But the Treasury said in a statement to the BBC that no specific proposals had been tabled for Britain's banks to get involved in any private sector deal. "HM Treasury is monitoring the situation closely, but no specific proposals for private sector involvement have been tabled," the statement said. Meanwhile, two major investors have warned of the gravity of the situation facing Europe. The joint head of the world's biggest bond fund manager, Pimco, has said Greece's sovereign debt restructuring is inevitable. Pimco's co-chief investment officer, Mohamed El-Erian, warned the nation's problems could "contaminate" Europe. And leading investor George Soros, who reportedly made £1bn when the pound crashed out of the euro's forerunner, the ERM, said the world was on the brink of another disaster. "Let's face it: we are on the verge of an economic collapse which starts, let's say, in Greece but could easily spread," he said. Mr Soros said it was almost inevitable that one or more eurozone country would exit the single currency. Britain's "big four" banks - Lloyds , Barclays, Royal Bank of Scotland and HSBC - have a relatively small exposure to Greece. They have a larger exposure to other struggling eurozone economies, particularly Ireland and Spain.